Custard style ice cream is made with a custard base, which contains egg yolks, cream, milk, sugar, and flavoring ingredients. Custard style ice cream provides for a smoother texture and richer flavor than ice cream made without eggs but it also contains more fat. Other ingredients can be added; such as fruits, candys, cookies, nuts, and other flavorings. Just use your imagination to create your own special treat. 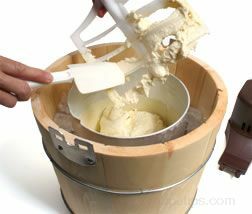 Provided below is information on how to make custard style homemade ice cream. 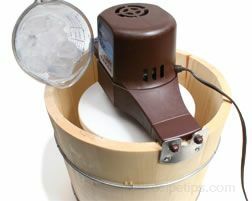 The freezing process shown below uses an electric ice cream maker that uses ice for freezing. Other freezing methods can also be used with this custard style ice cream recipe. For other freezing methods, see Homemade Ice Cream Freezing Methods. 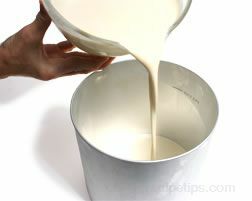 Pour the milk into the top pan of a double boiler or into a heavy saucepan. 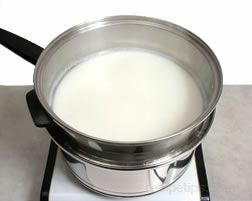 Over medium heat bring the milk to a gentle simmer (approximately 175°F) and then remove from the heat. In a separate bowl combine the sugar, salt and yolks. 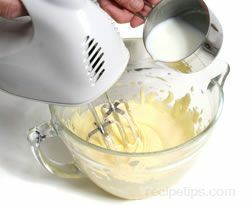 Whisk or beat with a hand mixer until mixture has thickened enough to hold a trailing pattern on the surface for 2 or 3 seconds, beat approximately 3 minutes. 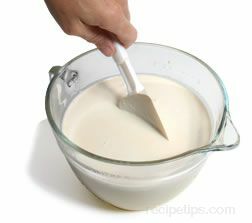 Gradually add the scalded milk to the thickened egg mixture. 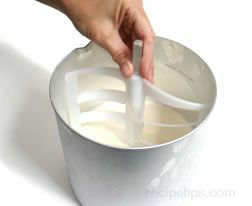 Beat on low or whisk while slowly pouring in 3/4 to 1 cup of milk at a time. Do not over beat the mixture. Beat just until the milk is evenly mixed into the egg mixture. Once all the milk has been added into the egg mixture, pour the combined ingredients back into the double boiler or saucepan. 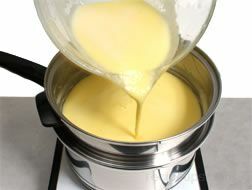 Over medium-low heat, cook the custard until it almost reaches the boiling point and has thickened enough to coat the back of a spoon. Stir constantly, scraping the sides and bottom of the pan. Cook to approximately 180°F. 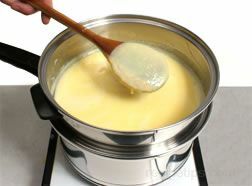 Do not allow the custard to come to a boil or it may curdle. 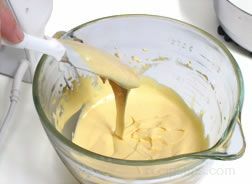 If custard does curdle, salvage by pouring thru a sieve and strain curdled pieces from the custard. 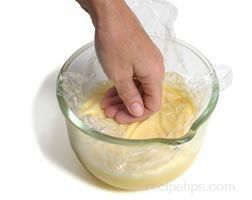 When the custard has thickened properly, remove it from the heat and allow it to cool before placing it in the refrigerator to chill. 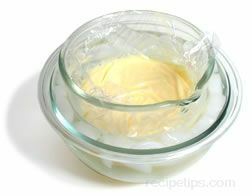 Pour the custard in a glass bowl and cover the surface with plastic wrap to prevent a film from forming on the surface. To speed the cooling process, place the bowl in an ice-water bath. After the custard has cooled, place it in the refrigerator for at least 4 hour but ideally for 24 hours. 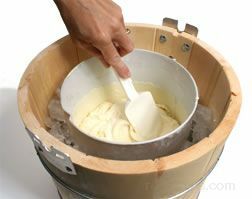 This aging process will give the mixture better whipping qualities and produce ice cream with more body and a smoother texture. After the mixture has aged (chilled) in the refrigerator, stir in the cream and vanilla. Stir or whisk just until mixture is well combined. The ice cream is now ready for the freezing process. Get Homemade Ice Cream - Vanilla Custard recipe. 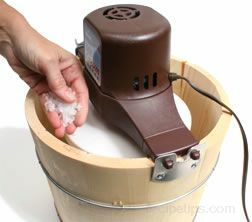 The instructions below are for using an electric ice cream maker that uses ice in the freezing process. This is just one type of model. 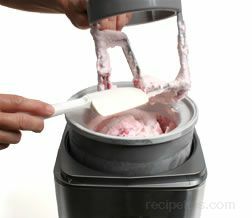 Realize that there are many different types of ice cream makers and unless you have this same model, it is best to read the user's manual for your model before beginning the freezing process. This type of freezing process is known as a "stir freezing" method because the ice cream is being stirred throughout the freezing process. For other freezing methods, see Homemade Ice Cream Freezing Methods. The ice cream can that will hold the ice cream during the freezing process should be stored in the freezer for at least several hours before starting the freezing process. 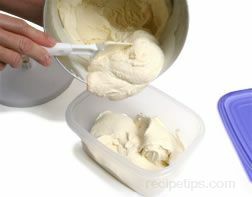 Pour the ice cream mixture into the chilled ice cream can, making sure to not fill the can more than 3/4 full. Some ice cream makers have a can that will have a fill line indicated on it. This will leave room for expansion when the mixture freezes. Also, keep in mind that if flavoring ingredients are going to be added at the end of the process, you will have to allow space for these ingredients. 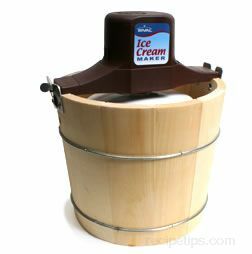 Place the dasher in the ice cream can, making sure the end is placed in the slot on the bottom properly and that the metal stem is at the top pointing up. Place the cover on the can. The stem of the dasher fits into the hole in the center of the cover. 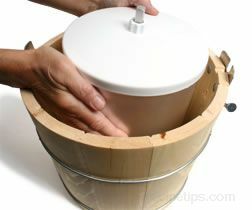 Place the covered ice cream can in the bucket, making sure it is center and the can is properly aligned in the slot at the bottom of the bucket. Fit the end of the motor drive with the two tabs into the plate with the two tab openings. Engage the motor drive by placing the stem of the dasher in the hole on the bottom of the drive unit and rotate the can slightly until it engages with the cover. At the opposite end of the drive unit, allow the tab to drop into the slot on the latch plate. Rotate the latch over the tab to lock into place. 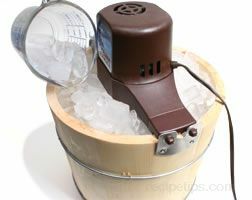 Plug in the freezer unit so it begins to churn and begin adding ice to the bottom of the bucket around the ice cream can. Place approximately an inch layer in the bucket. Sprinkle about 1/2 cup of rock salt (regular salt will also work) evenly over the ice. Note: When the unit is turned on, the ice cream can rotates, the dasher inside does not move. Continue to add layers of ice and salt as stated above until the ice level is to the top of the can. The unit should run for 20 to 40 minutes before it stops, depending on the amount of ice cream in the unit. Start checking the ice cream after 25 minutes because it may not stop on its own when the ice cream is done, especially if the unit is not full. Note: Salt is necessary to force the ice to melt. As the ice melts and forms a brine solution, it absorbs the heat from the ice cream mixture causing its temperature to lower. 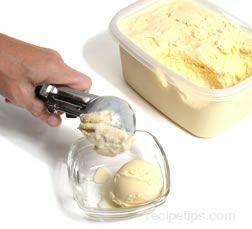 The ice cream mixture's temperture will gradually lower until it reaches its freezing point of 27°F if the proper proportions of ice and salt are used. A ratio of 5 cups of ice to 1 cup of salt should keep the melting solution at 8° to 12°F. If salt was not used the ice would melt at 32°F and would not be able to lower the ice cream mixture's temperature to its 27°F freezing point. Because of the coarseness of rock salt, it will work to melt the ice faster that regular salt, thus freezing the mixture quicker. When the unit stops or when checking the ice cream to see if it is done, unplug the unit to turn it off and remove the motor drive. 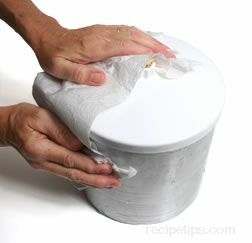 Before removing the cover, be sure to remove all the salt and ice from the top of the can and cover so it doesn't get in the ice cream when removing the cover. Remove the cover and pull out the dasher. Check ice cream for proper consistency. The ice cream should be thick but too soft to scoop. This consistency is good for stirring in flavorings. 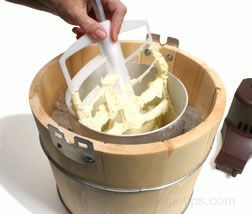 Use a spatula to remove the ice cream on the dasher. Stir in flavorings that are desired. 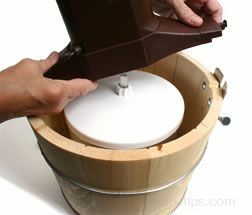 Flavorings can also be added before removing dasher and then by placing cover back on the unit and replacing motor unit to churn the ice cream to mix in flavorings. It may be easier to just stir them in by hand rather than going through the extra set up again. 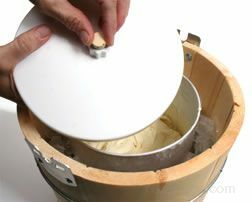 If hardening in the can, leave the ice cream in the can and pack the ice cream down firmly. Plug the hole in the center of the cover with the cork. 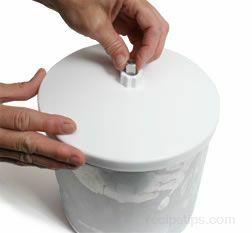 Place the cover back on the ice cream can. See illustration below. 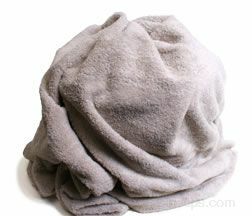 It is best to wipe the cover and can clean before the hardening process. Once the can has been properly cleaned, place can in the freezer for 3 to 4 hours until hardened. 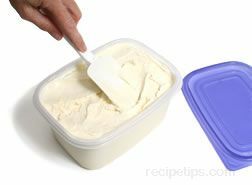 If hardening in a different container, scrape the ice cream into a container with an airtight cover. 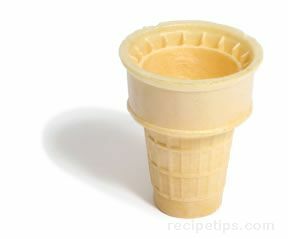 Pack ice cream down firmly and be sure to leave at least 1/2 inch head space for expansion during hardening process. Place the cover on the container tightly. 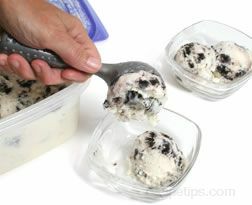 Place the ice cream in the freezer for 3 to 4 hours to harden. 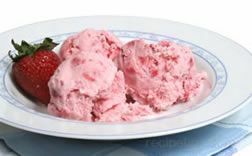 Once the ice cream has hardened, remove from freezer and serve. Return any remaining ice cream to the freezer for storage. 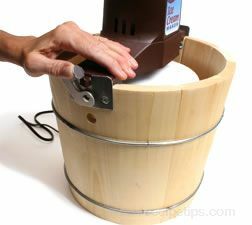 The ice cream can also be hardened in the ice cream maker bucket. Place the ice cream can in the bucket and pack the ice cream down in the can. Place the cork in the center of the cover and then place the cover on the can. Add layers of ice and salt the same as when going through the freezing process. Add enough ice to cover the entire can and cover. Cove the can with towels or a blanket and allow to sit for approximately 3 hours. The time that it takes to harden will vary depending on the amount and type of ice cream. 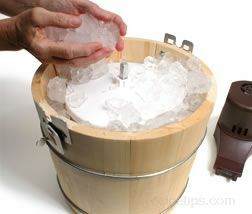 Unwrap the bucket and check the ice during this time and if needed add more to keep can covered with ice. Rewrap with covering. 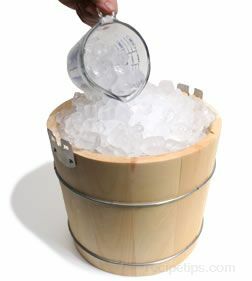 After the ice cream has hardened sufficiently, take the can out of the bucket and clean the ice and salt off from it. 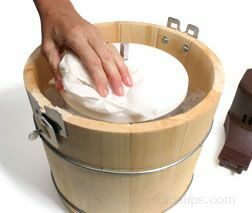 Remove the cover and scoop ice cream into bowls or cones. Serve and enjoy! homemade cream cheese ice cream.